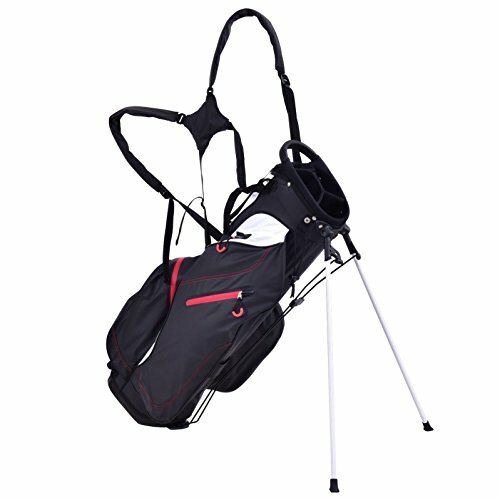 Golf plays anincreasingly important role in inter This golf bag is a in-style and compactstand bag that brings you a durable using satisfaction. You could bring severalnecessary clubs with you in the same time. This lightweight bag is equippedwith 5 zipper pockets and 1 mesh pocket ensuring you enough space toaccommodate your accessories or divot tools. The ergonomic design of straps addcomfort and convenience to make your round of golf an easy walk, doubling yourgolfing happiness. The foot support of this item can totally release your handswhen you do not use it. It will never fail your expectation as a good helper. Don'tHesitate To Buy It! Size Of HeadFrame: 9.8" x 7.3"
Water Resistance: Made of 420D Nylon, this golf shoulder bag is water resistance to avoid any liquid to permeate. And its sturdiness can well up to the additional wear and tear while using it. It surely guarantees you a durable lifetime for its sturdy construction. Reasonable Capacity: Featuring light weight of only 5.1lbs and portability, its 4 way dividers surprisingly offers you enough space to accommodate your golf clubs. There are 5 zipper pockets on this bag to bring you additional storage space, which you can put various accessories in. Considerate Added Values: Backpack-style shoulder strap for extra comfort provides you a convenient handle on the side to quickly carry and go. And the special zipper design adds both practicability and aesthetics to this product. Premium Travel Helper: It is quite great for traveling for it takes up very little space in a trailer, camper, or car trunk due to its compact body. You can just take it to your desired place effortlessly. And the bag can be stored neatly when you do not use it. Foot Support: With a mixed color of black and red and aluminum paint foot pipe support, it can stand steadily and balanced as you want to release your hands. And it can also stand straight with a plastic chassis. A rubber foot pipe bracket can well prevent the scratch.